El Vez (“The Mexican Elvis”) was Mezzo Lunatico’s original curator and host for last year’s first round of late night cabarets, and he returns this weekend with none other than Queen of Burlesque Miss Indigo Blue for a special Halloween show. Death! What a Way to Go! will be a Día de los Muertos mash-up of burlesque, aerial, dance, and of course- a Night of The Living Dead Costume Contest. Feather fans, zombies, and cocktails in a Spiegeltent sounds like a recipe for one bizarre Halloween. If you’ve somehow missed El Vez over the years, he’s actually much more than the Mexican Elvis; he’s been a performer and general patron saint of fringe-style arts for many years. Aside from his work with burlesque stars such as Indigo Blue, Catherine D’Lish, and Scotty the Blue Bunny, he has been a host and contributor to many a cabaret-related event from coast to coast and internationally. El Vez- aka Robert Lopez- first appeared in LA punk band The Zeros, was in Catholic Discipline with lesbian folk singer Phranc, and later appeared at many a rockabilly show with his backup band, the El Vettes. Incidentally, El Vez has also taken on the role of Reverend on several occasions- including the wedding of Xene Cervenka of seminal punk band X. It’s no surprise that he ended up equal parts cabaret mastermind and Mariachi-style social satirist. “Death! What a Way to Go!” is this Saturday, October 29 at Teatro ZinZanni’s majestic Spiegeltent- click HERE for tickets, or send an email with the subject line “En El Barrio” to burlesqueseattlepress@gmail.com for one of two pairs of FREE TICKETS! Happy Halloween, you dirty dirty zombies. 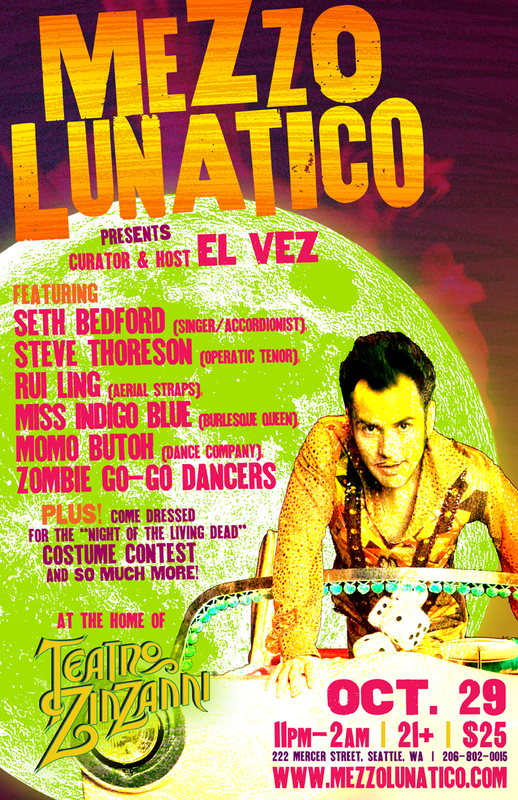 Mezzo Lunatico returns this weekend for a special Halloween show. ~ by angrytruffle on 10/26/2011.